The prisons chief wants the government to enact policy that would encourage state and corporate bodies to provide job opportunities for rehabilitated prisoners in a bid to reduce the high rate of recidivism. The call comes in the wake of news that 48 per cent of prisoners have served prior sentences. The newly-appointed Commissioner-General of Prisons, H.M.N.C. Dhanasinghe, stressed the escalating rate of recidivism was a result of failure to address the psychological consequences of newly-released prisoners needing to provide for their families and being manipulated into further crime. Prisons Department statistics show that at the beginning of this month there were 18,771 inmates across all prisons, including convicted, unconvicted, appellant and youthful offenders. 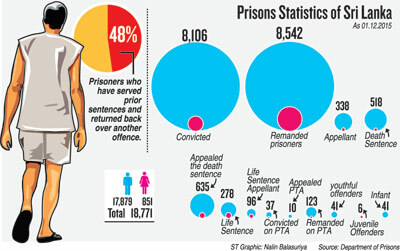 Of these, 8,106 are convicted offenders and 8,542 remanded prisoners. 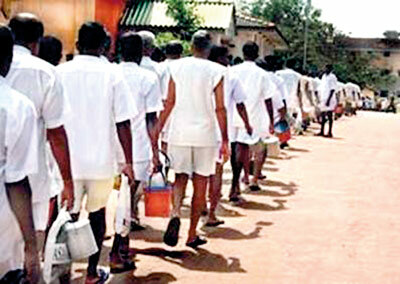 Mr. Dhanasinghe said a rehabilitation process should prepare inmates for the challenges they would face on release. It should include existing vocational training programmes, religious and aesthetic involvement, adult education and guidanceprogrammes. He said most people serving time in jail suffer psychological wounds from childhood relating to poverty, unemployment, family background, surroundings (especially in slums), social recognition, a low educational level and other factors. “While they improve their skills and talents in rehabilitation they should also possess the motivation, desire, and passion to use their skills to make a living good enough to provide for their families. If they fail to do so, with their fragile mindset they will find alternative ways to maintain their families,” Mr. Dhanasinghe said. He said society’s attitude towards prisoners was the same as towards those with grievous sexually transmitted diseases – people condemned released prisoners regardless of the nature of the crime committed and without understanding the reasons behind their committing such offences. “So when the father or mother gets branded as a criminal, society judges these people’s children the same way, ultimately letting those children be led into criminal circles,” the prisons chief added. There were 41 youthful offenders behind bars as of December 1, prison records show. Mr. Dhanasinghe said the government should draw up a policy for public and private institutions to accommodate rehabilitated prisoners with employment and prevent a new generation from entering jail. He said that under the Prevention of Crimes Ordinance prisoners can be granted work release from jail and this could be used to provide selected prisoners undergoing rehabilitation an opportunity to work for a company under the supervision and responsibility of the Prisons Department. A prisoner who failed to keep to the terms of the agreement could be penalised under s.12 of the ordinance. In 2014, some 500 prisoners were given work release outside prison, a decline from 2011 when 20,034 inmates were released under the same programme. “This would be a long-term investment for both industrialists and the Department as it would provide firms with skilled workers for their niche purposes and reduce the recidivism rate to, we hope, 22-25 per cent,” Mr. Dhanasinghe said. The Minister of Prison Reforms, Rehabilitation, Resettlement, and Hindu Religious Affairs, D.M. Swaminadan, told parliament last week that reforms will be instituted to improve the standards of prisons and the condition of prisoners. Reforms to be initiated next year include relocation of some prisons, improving prison infrastructure and inmates’ health, involving detainees in the development process, involving prisoners insocial decorum and making open-air jails to reduce congestion. Welikada, Bogambara, Badulla, Tangalle and other prisons will be moved outside city limits and the new facilities will be equipped with the latest technology. Responding to a question, he said that signal jammers will be installed to prevent the illegal use of mobile phones by prisoners. Dog patrols will be used to stop the circulation of narcotics in and outside prisons. Mr. Dhanasinghe said new CCTV systems would be installed to provide 24-hour monitoring within prisons.